At least 1 time in our lifetime, the black family has been affected by the influx of the black dollar being drawn from our communities and sent to another race's community. In 2005, Devin had this experience firsthand when a Korean owner of a beauty supply store threw him out for suspicion of stealing even though Devin hardly got completely into the store. This event infuriated the author-entrepreneur enough for him to open his own store and hire employees from the community that was being exploited. He successfully opened three thriving stores within an 18-month period and is now sharing the secrets on how you can too. 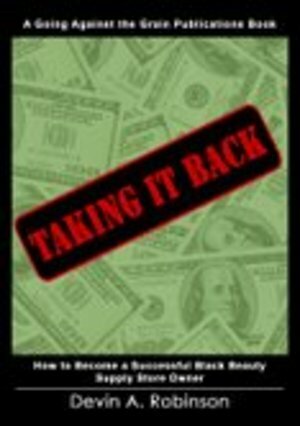 Taking it Back clearly illustrates methods on how to be successful as a retail storeowner. He gives specific direction, worksheets and contacts that you need to know in the industry. This book is sure to give you the wisdom you need to Take it Back!